Stunning Coastal Home with breathtaking views! 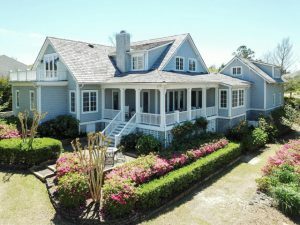 Quality 4 or 5 bedroom, 6 bath home built by Mack Braxton on beautiful Howe Creek. Home is on a high and dry lot. Open floor plan allows for easy living and exceptional water views from all rooms. Home boasts Chef’s kitchen with custom cabinetry, vaulted breakfast area, Thermador and Subzero appliances, 10′ ceilings,1st floor master suite with dual vanities and closets, soaking tub with bubbles and tiled shower, 3 large bedrooms upstairs with attached full baths, One of these has french doors that open to a balcony with water views, spacious light-filled FROG with full bath but most of all the wrap around covered porch and brick patio to catch the ever-changing views of the water. Perfect place for morning coffee or a glass of wine!